Prescription drug costs continue to raise fiscal concerns for public and private payers and affordability worries for consumers. Nationally, drug spending spiked in 2014, mainly due to new and costly breakthrough treatments for hepatitis C that came to market starting at the end of 2013, along with fewer opportunities to control spending through greater use of generic drugs. For Medicare, which accounted for 29 percent of national retail pharmaceutical spending in 20161, average per capita costs in the Part D prescription drug program have been rising, and are projected to grow more rapidly over the next decade. Medicare Part D average per capita costs increased from 2.4 percent between 2007 and 2013 (the year before new hepatitis C treatments became widely available) to 4.4 percent between 2013 and 2016, and are projected to increase annually by 4.7 percent between 2016 and 2026.2 This increase will affect both federal spending and beneficiaries’ out-of-pocket costs for prescription drugs. Having #Medicare negotiate #prescriptiondrug prices directly is a popular idea. But would it save money? In response to higher drug spending growth and heightened attention to drug prices, some policymakers and experts have proposed allowing Medicare to negotiate the price of prescription drugs. Under current law, the Secretary of the Department of Health and Human Services (HHS) is explicitly prohibited from negotiating directly with drug manufacturers on behalf of Medicare Part D enrollees. 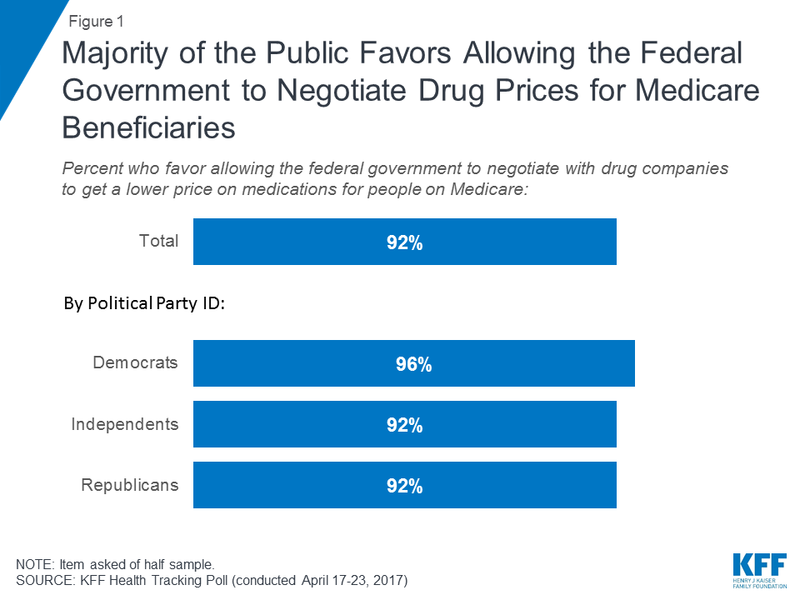 Allowing the federal government to negotiate drug prices for Medicare beneficiaries is supported by 92 percent of the public, including a majority of Democrats (96%), Republicans (92%), and Independents (92%) (Figure 1). This proposal was also endorsed in a recent report from the National Academies of Sciences, Engineering, and Medicine. President Trump has said he will “bring down drug prices” and has repeatedly criticized the current-law policy that prohibits the government from negotiating with pharmaceutical companies in an effort to lower drug prices in Part D and achieve federal savings.3 He has also said “we don’t bid properly and we’re going to start bidding.” To date, Republican Congressional leaders have not outlined specific proposals to reduce drug costs. Speaker Ryan’s A Better Way proposal and recent budget proposals put forward by House Republicans propose changes to Medicare, but do not directly address the issue of Medicare drug spending or prescription drug prices. Proponents believe that giving the HHS Secretary the authority to negotiate drug prices on behalf of millions of Medicare beneficiaries would provide the leverage needed to lower drug costs, particularly for high-priced drugs for which there is no competition and where private plans may be less able to negotiate lower prices. Opponents believe the Secretary would not be able to get a better deal than private plans already do. They also express concern that price negotiations would limit the ability of pharmaceutical companies to invest in pharmaceutical research and development. This issue brief provides a short history of the concept of allowing Medicare to negotiate drug prices, describes various approaches, and assessments of their potential savings from the Congressional Budget Office (CBO), and considers the prospects for action in the future. The idea of allowing the federal government to negotiate prescription drug prices with drug manufacturers on behalf of Medicare beneficiaries has been raised in Medicare policy discussions for over a decade. In the years leading up to the enactment of the Medicare Part D prescription drug benefit in the Medicare Modernization Act of 2003, lawmakers debated whether the federal government should provide a drug benefit directly, but in the end opted to provide drug coverage through a marketplace of private plans that compete for business based on costs and coverage. Under Part D, private plan sponsors separately negotiate drug prices with pharmaceutical companies, establish formularies, and apply utilization management tools to control costs. Notably, Congress added language to the MMA, known as the “noninterference” clause, which stipulates that the HHS Secretary “may not interfere with the negotiations between drug manufacturers and pharmacies and PDP sponsors, and may not require a particular formulary or institute a price structure for the reimbursement of covered part D drugs.” In effect, this provision means that the government can have no role in negotiating or setting drug prices in Medicare Part D. This is in stark contrast to how drug prices are determined in some other federal programs; for example, the statutory requirement for mandatory drug price rebates in Medicaid, and a requirement that drug manufacturers charge the Department of Veterans Affairs (VA) no more than the lowest price paid by any private-sector purchaser. Though the MMA adopted a market-oriented approach to providing the Medicare drug benefit and prohibited any “interference” by the HHS Secretary with respect to drug prices, some lawmakers continued to press for authorizing the Secretary to negotiate drug prices, primarily by striking the “noninterference” language, a proposal favored by the vast majority of Americans in 2006. Nonetheless, bills proposing this change stalled in Congress in the face of strong opposition from the pharmaceutical industry, and equally strong resistance among Congressional Republicans to any effort to expand the role of government in Medicare’s drug benefit. For the next several years, the push for Congressional action on drug prices waned as Part D benefit spending growth remained relatively flat—and lower than initially projected—with a large number of brand-name drug patent expirations and growing use of generic drugs helping to keep drug spending in check. Interest in this proposal also may have diminished once CBO concluded that proposals to give the Secretary authority to negotiate drug prices would have a “negligible effect” on Medicare drug spending (see below). What are various approaches to allowing Medicare to negotiate drug prices? A middle ground approach, and one that responds specifically to recent concerns over high-priced specialty drugs, would authorize the HHS Secretary to negotiate prices solely for a limited set of relatively expensive drugs, including unique drugs that lack therapeutic alternatives.7 A recent proposal directs the HHS Secretary to prioritize negotiation on specialty and other high price drugs, but also includes a fallback for achieving savings if the negotiation process fails. The fallback is to essentially use the VA price, which has a narrow formulary and secures much steeper discounts than private payers do. The bill also proposes to give the Secretary authority to establish formularies in Medicare and use other pricing tools he currently lacks. The bill has not been scored by CBO. What has CBO said about the potential for savings? CBO has said that giving the Secretary authority to negotiate lower prices for a broad set of drugs on behalf of Medicare beneficiaries would have “a negligible effect on federal spending.”8 It based this assessment on its view that the Secretary would not be able to leverage deeper discounts for drugs than risk-bearing private plans, given the incentives built into the structure of the Part D market, where plan sponsors bid to participate in the program, compete for enrollees based on cost and coverage, and bear some risk for costs that exceed their projections. Why has this idea resurfaced and what are its prospects? With Medicare Part D prescription drug spending growth on the rise, and strong public support for policymakers to take action to ensure the affordability of medications, policy options to lower drug prices, including allowing Medicare to negotiate drug prices, are being mentioned by some policymakers in Congress and by President Trump. Other approaches not addressed here but also proposed as ways to control drug costs include: greater drug price transparency, modifying regulations to speed generic drugs and biosimilars to market, value-based purchasing, reference pricing, reducing drug companies’ market exclusivity period, and extending the Medicaid drug price rebate to low-income Medicare Part D enrollees. According to CBO, the rebate proposal would achieve $145 billion in savings to Medicare over a ten-year period (2017-2026). Allowing Medicare to negotiate drug prices would require a change in the law, which means that bipartisan support would be needed for legislation to move forward in Congress. Although the President has endorsed the idea, Republican policymakers in Congress have historically been opposed to it. And there has been, and is still, strong resistance to this idea from the pharmaceutical industry. While the immediate prospects for this proposal and other prescription drug savings proposals are unclear, the issue of drug price affordability is likely to continue to weigh on the minds of consumers at the pharmacy counter.